Steel versus aluminum is in fact a strength versus weight issue, which gives way to a common misunderstanding arising, even among engineers. 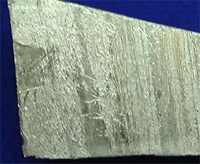 Whereas the facts are that some aluminum alloys are stronger than some steel alloys, it is only a partial truth that aluminum alloys are stronger than steel. We can understand this difference between steel and aluminum by a comparison based upon strength and weight, stiffness and yielding, and magnetic and nonmagnetic properties. As we know, strength refers to the maximum load a material can bear without bending and loosing its shape, and the stiffness refers to the yielding properties of a material, and how much it can bend under a load or when pressure is applied. The parameter to quantify stiffness is called the Modulus of Elasticity. The relative stiffness of steel versus aluminum have no stiffness advantages over each other, as both of the materials can withstand and bear extreme pressure and tons of load. Aluminum beats steel, as its bending density is about 1/3 of the density of steel, and the advantage of thickness offsets the 1/3 in strength, making aluminum more dent resistant than steel of the same weight. One difference that steel has compared to aluminum, is that after repeated loads, aluminum will fatigue. Steel has an indefinite fatigue life, which means it has enough strength to withstand repeated load cycles, and hence, it lasts longer, or is preserved. Steel is heavier than aluminum, as steel is about three times heavier for the same length of aluminum. The tautness or tensile strength of high-grade aluminum is in same ratio as high-grade steel. If we compare steel versus aluminum used as construction material, the specific gravity for stainless steel is 7800 ton/m, and aluminum is 2700 kg/m3. Steel, when compared to aluminum, is low tech and slightly destructive, as steel will spark if you use an angle grinder and briefly touch the metal. Once the bit touches steel it will spark, whereas aluminum does not spark. Where deflection is important, aluminum has an edge over steel. Steel has more rebounding properties than aluminum. Although, where deflection is possibly, steel is preferred because it is easier to weld. Aluminum is nonmagnetic compared to steel, however, some types of steel alloys are also nonmagnetic. If we make this comparison on the basis of the micro-structure of the steel and aluminum, we find that the carbon iron component of iron structures are not magnetic at all. The nonmagnetic aluminum material therefore will have the magnetic property 1. Even 100% austenitic steel does not have the permeability of 1, as it is subject to change during processing, and in practice, it has not been achieved, and the permeability values are always above 1. 1. Steel versus aluminum can be compared by using the parameters of strength, weight, yielding and magnetic properties. 2. Steel strength over aluminum is almost the same, but steel is three times heavier than aluminum. 3. Steel has a preserving quality, even after thousands of load cycles, but aluminum will fatigue and destroy. 4. Aluminum has more malleability over steel, as it has more bending density compared with the density of steel. 5. Aluminum is nonmagnetic and deflective, whereas steel has rebounding qualities and is easier to weld. charm. "Difference Between Steel and Aluminum." DifferenceBetween.net. March 22, 2010 < http://www.differencebetween.net/object/difference-between-steel-and-aluminum/ >.